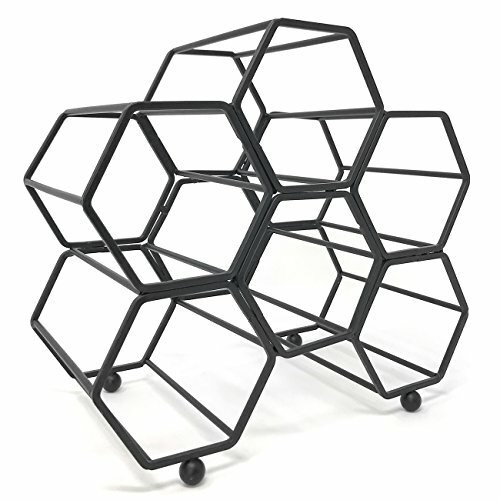 Clever Home Modern Hexagon 6 Bottle Table Top Steel Wine Rack (Matte Black) by Clever Home at The Primavera Blog. Hurry! Limited time offer. Offer valid only while supplies last. Keep your wine or liquor at your fingertips in this compact and sleek countertop wine rack. The wine rack can hold 6 standard bottles. Constructed of sturdy steel and finished off with ball feet. Available in 3 fashionable colors: black, rich rose gold and silver chrome. You will surely find one that complements your decor. Dimensions: 10.5 L x 5.5 W x 9.75 H inches. Each opening is 3.25 x 3.25 inches. If you have any questions about this product by Clever Home, contact us by completing and submitting the form below. If you are looking for a specif part number, please include it with your message.